The July State Employment and Unemployment data, released today by the Bureau of Labor Statistics, paint a similar picture to what we have seen for much of the past year: moderate job growth for the majority of states, with a handful of exceptions scattered throughout the country. Overall, the pace of job growth across the states may have slowed slightly in recent months compared with the beginning of the year or the same period last year. Similarly, the unemployment rate ticked down or stayed the same in a majority of states, although slightly more states experienced increases in unemployment than earlier in the year or at the same time last year. As the labor market moves closer to full employment, both of these findings are not surprising. Nevertheless, if we are to ever reach full employment, we need to keep adding jobs and the faster, the better. From April to July, 42 states added jobs with the largest percentage gains occurring in South Dakota (+1.1 percent), Maine (+1.0 percent), Colorado (+0.9 percent), Florida (+0.9 percent), and North Dakota (+0.9 percent). Over the same period, eight states and the District of Columbia lost jobs, with Montana (-1.1 percent), Wyoming (-0.7 percent), D.C. (-0.6 percent), and Oklahoma (-0.4 percent) posting the largest percentage losses. Changes in state unemployment rates since the spring were more mixed. 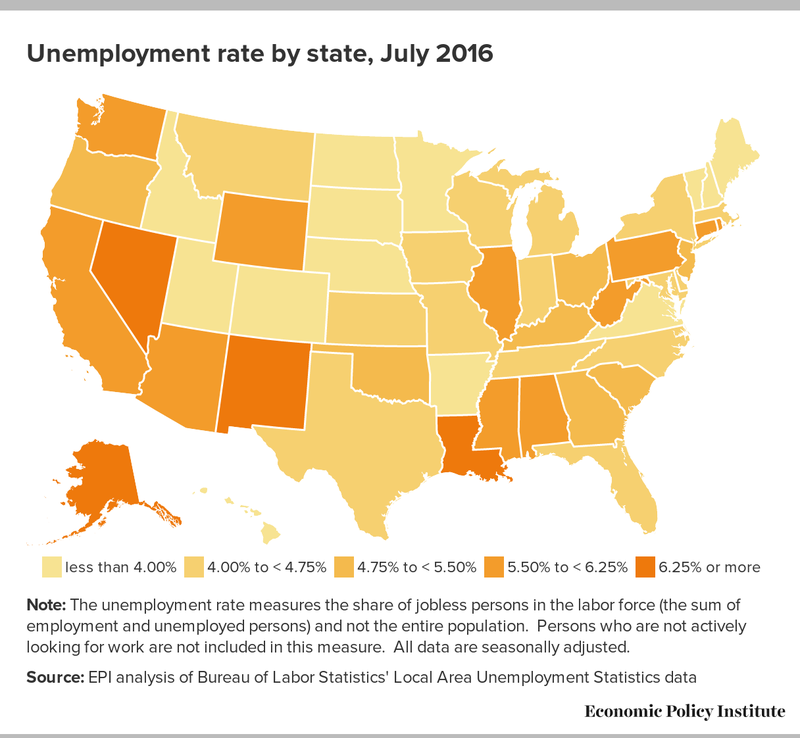 From April to July, the unemployment rate fell in 17 states and the District of Columbia, with the largest reductions occurring in Illinois (-0.8 percentage points), North Carolina (-0.7 percentage points), and West Virginia (-0.7 percentage points). Over the same period, unemployment rose in 25 states. Colorado (+0.7 percentage points), Nevada (+0.7 percentage points), and Oregon (+0.7 percentage points) had the largest increases, although all three of these states simultaneously added jobs. The unemployment rate was unchanged in 8 states. 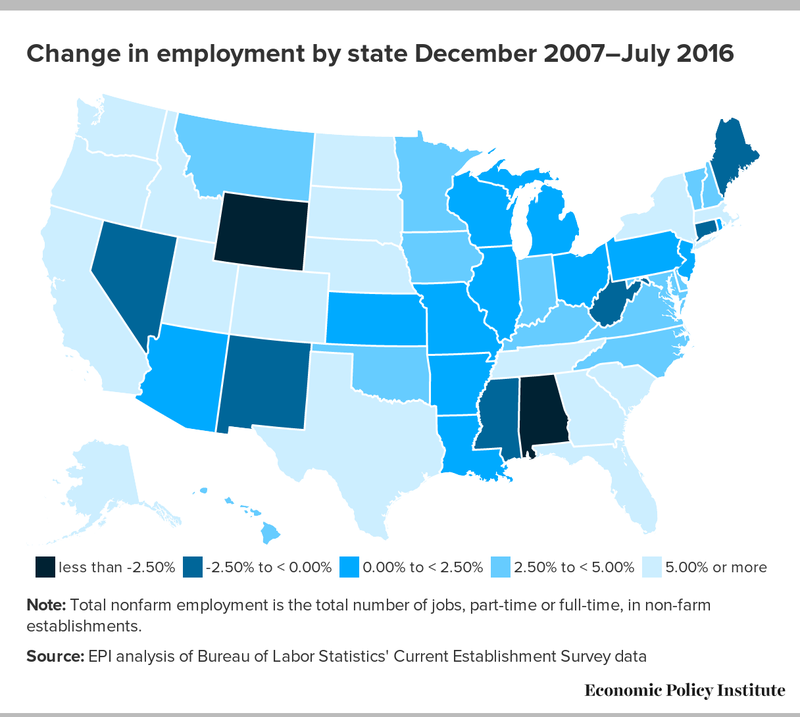 Today’s report again confirms that most state labor markets continue in the right direction, and some are getting closer to their pre-recession conditions. Still, the pace of recovery has been far too slow, and much of the blame should fall with state and federal lawmakers who cut public budgets at the exact time when public spending should have been filling in for weak private sector demand. Until stronger wage growth signals that the country has reached the full-employment finish line, policymakers should be working to pick up the pace. The Federal Reserve should keep interest rates low and state policymakers should take advantage of low rates to expand investment in infrastructure.